Not in the Solent, but a really alarming demonstration of how a small wave can capsize a yacht, have a look at this VIDEO picked up the RSS feed on our Solent Now page. On 22nd January, Geoff Matthews of HM Coastguard gave a fascinating talk about the major reforms taking place within the Coastguard service. The changes arise from the advances in information and communications technology over the last 2 decades. It was clear that Geoff firmly believes that the new situation will represent a major step forward. However the transition will, as he said “present some challenges”. We agree with that sentiment. A new organisation, with some new skills is bound to present a challenge, and there will be bumps and potholes along the way. We wish the service the good fortune to apply their professional skills to negotiate them successfully. At the same time, the withdrawal by MOD from civil search and rescue (and the retirement of the long range Nimrod aircraft) has led to one of the largest private contracts let by government for new all civilian SAR (Search and rescue) coverage. But as HMCG has been contracting civil helicopter services for many years, this change is just one more part of the reorganisation that has to be managed. In his talk (part 1 of the video) Geoff addresses all these issues, and then addresses questions from the audience (part 2 of the video}. “One of the major changes will be the introduction of General Direction No. 6. Cowes Chain Ferry. This General Direction governs the navigation of the Chain Ferry and includes giving the Chain Ferry right of way over most vessels. Note also that there is a requirement for a sailing boat fited with an engine to have it running and ready for use in the Inner Harbour area. Perhaps they should stick to their day jobs! More seriously, Coastguard is in for a year of change. We arranged for a senior Coastguard, Geoff Matthews, to deliver a talk explaining the changes. This was the opening move in an exercise held last week in Southampton Water. Tests of the Solfire plan take place at regular intervals, but it is only once in every six years that a ‘live’ exercise is carried out. On this occasion the bunker vessel Whitchallenger acted the part of the casualty. Other ‘actors’ included Svitzer Sarah, a tug equipped with fire hydrants, RNLl lifeboats, and police and harbour launches. Numerous fire engines appeared on the Docks too. It was presumed that VTS (The Vessel Traffic Service which monitors all ship movement in Southampton port area and its approach) had called a SolfireB incident, implying that they would require supporting assistance. Coastguard at Lee on Solent was notified and took charge of Search and Rescue resources. 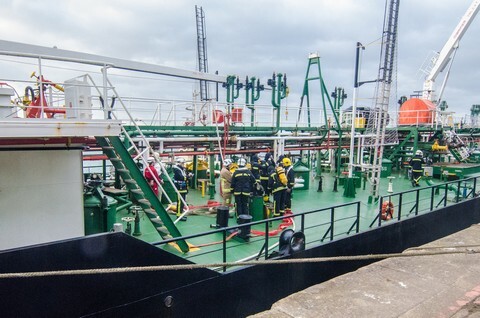 The fire brigade were alerted and moved appropriate equipment to the docks. 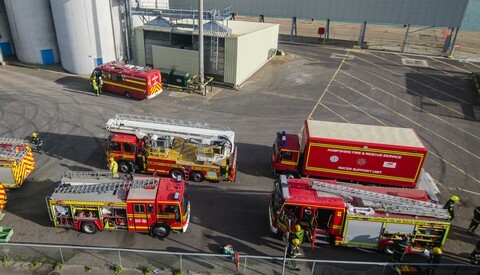 Meanwhile, representatives of the police, Maritime and Coastguard Agency, Hampshire Fire and Rescue service, and the Hampshire Ambulance Service all gathered in the Marine Incident Control Room kept standing by in the port VTS building. As required by the plan, police chaired the proceedings, releasing the harbourmaster to attend to urgent needs. “VTS, THIS IS ALBION. ANCHOR DRAGGING….` The scenario slowly developed. The fire tug was despatched to stand by the casualty. The pilot cutter took 2 senior firemen to the ship to assess needs on board. Eventually a team with necessary portable equipment was despatched. A decision was taken to bring the tanker alongside to make it easier to fight the fire. For some of the firemen involved it was their first experience of working in the confined spares of a ship. Many other lessons were learned, or relearned. It came as no surprise that the main lessons related to communication issues. Some were surprisingly basic. For example, incident notification by fax was not completely successful. The world has moved on. Messages by email or SMS are more likely to work today. The plan will need changing! Analysing the exercise later, a number of issues were identified, but the main objectives were judged to have been achieved. Of course, the incident scenario could have been worse. But in a real situation where the fire was not brought quickly under control, or where oil started leaking from the ship, then the incident would have been upgraded to SolfireC, and additional powers and resources available to the MCA would have come into play. Maybe that is a scenario for a future exercise. SPS was invited to observe the exercise. It is good to be able to let Solent users and residents know that such plans exist and are regularly tested. However, VTS is to be relocated within a year, and Lee on Solent Coastguard will close in September. Neither event should make a significant difference except that the new Coastguard HQ at Fareham may offer some useful extra resources. It opens in September 2014. An exercise to test all the new facilities Sometime in 2015 would seem to be indicated. We are aware that other emergency plans to deal with Solent incidents exist, including plans to deal with oil (or other pollutant) spills and nuclear accident. Southampton is also the home of Oil Spill Response Ltd, which holds the national stock of materials for dealing with spills. We hope to add a section to our “How the Solent works” section of our website soon. For more information about Search and Rescue resources click here. For details of proposed Coastguard changes, click here. Note that on January 22nd Geoff Matthews, who is managing the move to the new Coastguard facility at Fareham will be giving a talk about the changes. Click here for details and to book your place. 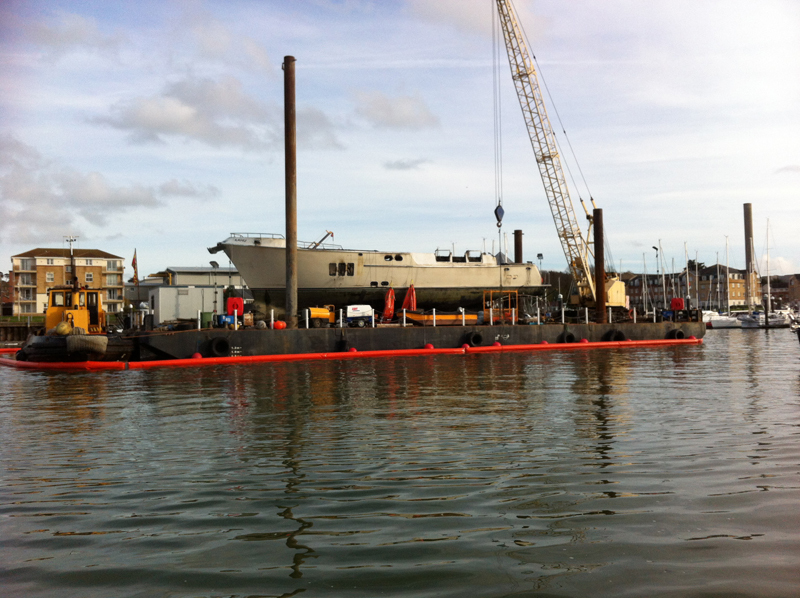 We reported the fire that led to the superyacht sinking in the River Medina last week. 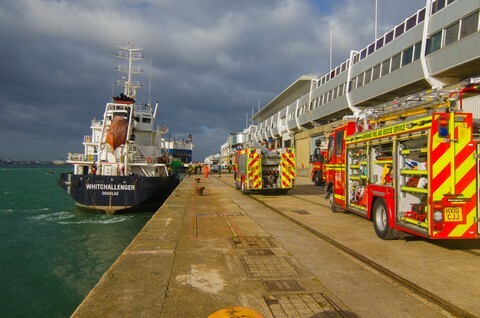 The emergency services in the Solent area have collaborated to produce an emergency response plan to deal with marine accidents that could arise in the port areas of Portsmouth and Southampton. By agreement with HM Coastguard the plan will also extend to cover the West Solent. 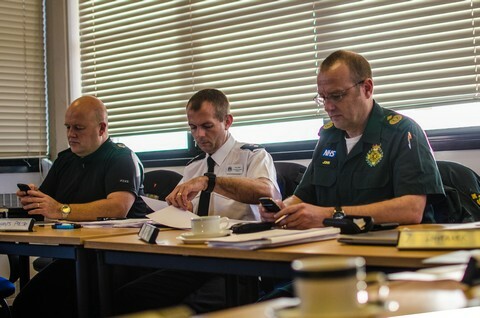 From time to time the plan, known as Solfire, is tested in a realistic exercise. The next exercise will take place tomorrow, Thursday 14 November. The scenario is summarised in a Notice to Mariners. Oil spill plans were put into effect. Although we shall be losing the Coastguard station at Lee on Solent, the new National Marine Operations Centre to be based at Segensworth, near Fareham will offer fully modern facilities with the Solent area as one of its primary functions. Work has already started on installing, testing and commissioning the new systems on which modern Search and Rescue (SAR) communications depend. This will be the hub of the national Coastguard system, allocating resources to where they are needed, and coordinating the new helicopter service, and all the voluntary organisations that contribute to our SAR services. The changes needed to bring this about are reviewed in our Coastguard Reorganization Issues page. The picture below is taken from the new meeting and observation gallery, overlooking the main operational area of NMOC. In the event of a major incident (such as when the Napoli went aground in Lyme Bay, this is probably where SOSREP will establish a command centre. In such situations SOSREP acquires the full powers of the Secretary of State to direct emergency resources. Direct coastal services will be maintained by shore teams at Hillhead and other locations, supported by the National Coastwatch Institute volunteers.